If you are able to spin a plate, juggle and use the diabolo and a few more props, then have you ever considered running a Circus Skills Workshop at a local event or a fundraiser? Here are some of the most common types of workshop I currently run. Each have their own advantages and disadvantages, and some can be mixed together to create a more unique and tailored experience for the people you are teaching. Snooker Table Workshop This is the method I use the most when conducting workshops in formal settings such as schools, scout groups etc. Place different sets of equipment in the spots that would be the pockets on a snooker table (6 pockets or if it is a smaller workshop, then perhaps just 3 or 4 pockets). After a quick demonstration of how to use the props in each pocket, the participants are divided into small groups and spend a certain amount of time at each zone, moving around clockwise on an agreed signal such as the blowing of a whistle or when you shout to tell them to move on! This is also known as a taster session as it familiarises the pupils with all the props. On future visits, the participants can perhaps learn a bit more skills with their favourite props. Show Based Workshop This workshop builds towards a show being performed towards the end of the session. It is best not to announce that there will be a show at the end of the workshop until around halfway through your workshop as by this time, the pupils will be excited about all the different things they could do in the show, rather than having the pressure of performing when they don’t know anything yet if you tell them at the start! I would advise against organising a talent show where there is one winning act, as everyone that is willing to perform should be encouraged! Lessons A lesson built around 1 Juggling Prop, such as the Diabolo. This will give the participants a solid grounding in how to use this item. Further lessons for the same pieces of equipment will be able to move the students onto more advanced tricks or a different prop could be chosen for the next visit! Drop-in Workshop Ideal for Fun Days and outdoor events. As people are allowed to join in and leave the workshop whenever they want, you are unable to give a quick demonstration of how to use all the props at the start, so there is more of a reliance on welcoming people to the session and giving them a quick lesson in whichever prop they have already picked up and are staring at! An age limit may be necessary, and potentially a maximum number of people allowed into the workshop zone in order to maintain safety and to stop items going walkabout! 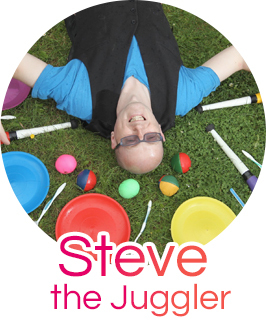 If you do not have enough equipment to run a Circus Skills Workshop, then please consider my discounted workshop packs and Juggling Kits. Happy to provide a custom quote for exactly what you need and also to discuss your circumstances and advise the best way to consider running your workshops. In the next newsletter, I will offer advice on other aspects of running a Circus Skills Workshop such as how many participants, tailoring for the age group, duration of workshop, public liability insurance and much more. New Website due very soon! It has already been 18 months in the planning and designing! I had hoped to launch before Easter, but I found some more new features that were worth adding to make the site even better, including a new style of newsletter (see sidebar for more information on your new look next issue), so I am still working closely with the design and back end team to get my new website looking absolutely fantastic. Most pages from the current site have been completely rewritten and vastly improved. I will not say too much just now as you will be able to see it for yourself hopefully in the next month, fingers crossed! The next edition of the Jugglingworld Newsletter will look completely different! This is because I have upgraded my Newsletter software to a more advanced package. Please make sure you have added my email address steve@jugglingworld.biz to your safe senders list so that you definitely receive it! I will send out my next newsletter as soon as the new website has launched so you can be the first to know that it is up and running. If you are a member of Facebook, you can visit my Jugglingworld Store page and add yourself as a fan! Jugglingworld Facebook page. This fan page for all things Jugglingworld Store related contains video clips and more information about the online store. Drop by and leave a message please! What do you think of this Newsletter? It would be great to receive any feedback on what you think of this newsletter, whether it is helping you improve your juggling skills (if you are a juggler) or if there are any things you think I should be mentioning or covering as a main article, especially as the newsletter is due to change format as of next issue! Please also let me know about the frequency of the mailouts. Would you prefer more newsletters or have I got it just about right?! I appreciate all feedback to help me shape future editions. The latest products in my store include some new DVDs from the wonderful and always entertaining Haggis McLeod (Complete teach Yourself Juggling DVD, Club Juggling and Passing DVD), as well as some new Diabolo’s. The Luminous Babache Tornado Diabolo (little sister to the mighty Babache Finesse series of diabolo’s which can accept all the evolution kit add-ons) and Sundia Sun Crystal Diabolo are now in stock. Visit my online Jugglingworld store (UK only).